A jungle-dwelling woman discovers a demon growing in the front of her leg. There’s quite an adventure to be had, trying to get it out! 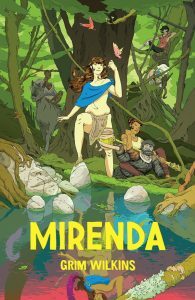 Mirenda, the trade book released by Image, collects the first five issues of Mirenda. Originally appearing in Island magazine, Mirenda, according to the publisher, picks up in style where Frazetta and Moebius have left off. 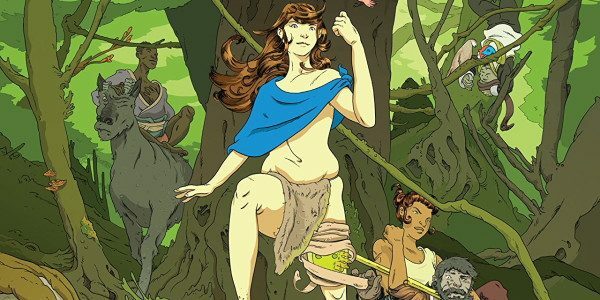 We can see why: Mirenda is a young woman, clothed only in a waist wrap loincloth. The rest of her modesty is hidden by flying leaves, strategically placed branches, flowing hair, and that sort of thing. A Frazetta ingenue, alone in the jungle, with a demonic presence in her leg. The Moebius reference rings true too… there is an atmospheric, free flowingly intuitive look to page after page of Mirenda. Characters are introduced, camera angles vary from worm’s eye view to drone-like top-down angles. The terrain changes page by page. Colours come out of the blue and recede as quickly as they came. The narrative is told almost entirely without words. Word balloons contain pictures and pictographs instead of text. Like Mirenda, we are all alone with a long journey ahead. It’s all good, but opaque, challenging and eye-catching at the same time.